With winter-weather cancellations falling on a Monday three weeks in a row, some University of Rhode Island classes have yet to be held this semester. Three weeks and four cancellations into the spring semester, the University of Rhode Island is in the process of determining how to supplement class time that has been lost to winter weather. 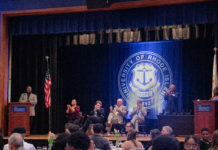 The URI Faculty Senate, a group of professors responsible for working with President David Dooley to formulate university policies – including the academic calendar – is in the process of determining the right course of action to make up for lost classes and prepare for further cancellations. Braham Nassersharif, chairperson of the Faculty Senate and professor of engineering, is currently working in conjunction with the provost and the Academic Calendar Standards Committee to formulate plans that will be submitted to the senate at their monthly meeting on Feb. 19. Â Nassersharif declined to elaborate on the specifics of the snow day make-up suggestions until approved by the Senate, but said that depending on class size, Monday evening classes could meet on Friday evenings to make up class. Though the provost’s office could not be reached for comment on the exact number of classes that have yet to be held, a search of e-Campus suggests that over 100 classes and labs have been continually cancelled due to snow. Â According to Nassersharif, URI accounts for two weather cancellations when making the academic calendar. Â This semester, classes have been cancelled after 4 p.m., on Monday Jan. 26 and for the full day on Jan. 27, Jan. 28, Feb. 2. and Feb. 9. Though for some students these days off were a surprise vacation, many others are concerned by the instruction they have missed. Â Viki Panteleakis, a sophomore communications and writing double major, has yet to attend her COM310 course, the Initiative to Educate Afgahn Women. Â The fact that, so far, the university has left makeup work to the discretion of the professor has been a source of stress to Panteleakis. Nassersharif said at this point in time he does not foresee a situation where work is so delayed that students will not receive course credits. Because classes this semester started on a Wednesday and lab sections of courses usually do not meet before the lecture, some students with lab classes on Monday have also yet to meet. In order to keep his classes on schedule, Smith’s professor, Dr. Michael Tammaro, has also cancelled Tuesday sections of the lab. Â “In the end, we’ll have lost very little content, if any,” he said in an email. Â Because the lectures for physics are designed to supplement the labs, his classwork has not yet been affected. Because the faculty senate meets monthly, Nassersharif said they sometimes have “difficulty” dealing with snow days. Â For the extent of the semester Nassersharif is requesting “delegative authority” to the Faculty Senate executive committee so they can make decisions regarding makeup policies.